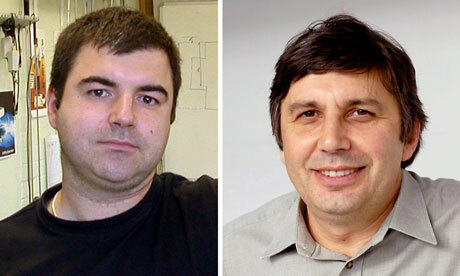 So it's been announced that the University of Manchester professors Andre Geim and Konstantin Novoselov. Geim and Novoselov have successfully isolated graphene from graphite to identify its behavior. But the question that has been entering everyone's head is: what exactly is graphene? How were these professors chosen? "Carbon, the basis of all known life on earth, has surprised us once again." 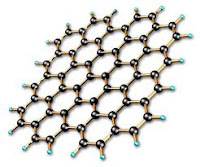 Graphene is a 1 atom thick sheet of carbon atoms in a honeycomb lattice. It is made out of carbon atoms and their bonds. Since Graphene is only 1 atom thick, it is about 0.142 nanometers. Stacked together, graphene makes up graphite, and is also the base for charcoal and fullerenes. It is referred to as a "two-dimensional material" because of its thickness (or lack thereof). Graphene has a handful of potential applications such as acting as a sensor for gas (since its size is so small, it is good at detecting absorbed molecules indirectly), acting as nanoribbons that can be cut into a particular pattern to give it electrical properties (as a semiconductor for example), acting as transistors , or acting as integrated circuits (since it has a high carrier mobility and low noise). There has also been optimism that it can be used as an anti-bacterial against bacteria like E. coli and keeping foods fresher longer. Graphene is dense and conducts heat and electricity. Not even helium can pass through it. The two scientists, Geim and Novoselov, isolated the graphene by peeling it "off of a graphite crystal using Scotch tape." How does the Royal Swedish Academy of Sciences decide a winner? 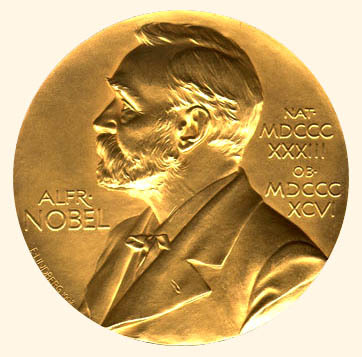 The Norwegian Nobel Committee (made up of 5 independent members) have been choosing the Nobel Peace Prize recipients since 1901 ( the government was banned from sitting on the committee to avoid political influence in 1936). Records of nominees can be kept confidential for 50 years. Nominees are accepted from a select group of individuals and then investigated by the NNC. Sometimes the Nobel Prize can be given to someone who has yet to complete their work, but is making great headway. The NNC choses a list of 5-20 people and then attempts to reach a unanimous decision by October. If the unanimous vote is not reached, then the majority vote decides the recipient. Previous recipients of the Nobel Physics Prize include Albert Einstein (1921) and Otto Stern (1943). What is the difference between the various forms of Carbon? Will graphene chips replace silicon chips in computer?